'Anti-Pantigate' bill tabled in the Dáil to stop "the litigious and thin-skinned"
Stephen Donnelly says that he feels broadcasters are already being more cautious as a result of the controversy. 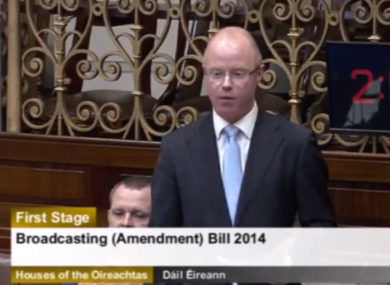 INDEPENDENT TD STEPHEN Donnelly has tabled a bill which aims to remove the the term “offence” from the Broadcasting Act as he believes its inclusion can be used to “gag free speech”. Donnelly told the Dáil this afternoon that he is introducing the bill in the wake of the Pantigate controversy which he says, along with the current legislation, has already caused broadcasters to “err on the side of caution”. “I don’t believe people should be censored for saying offensive things, whether or not that offence is reasonably taken or not,” the Wicklow TD told deputies. The legislation in its current form gags free speech, harms public debate and means broadcasters can be bullied by the litigious and thin-skinned. The TD referenced the letter from RTÉ’s head of television Glen Killane to staff explaining the rationale behind the station’s payout to the Iona Institute as evidence of how the current rules restrict broadcasters. The TD said that it has been suggested in the media that Minister for Communications Pat Rabbitte is considering amending the act so that it instead refers to “reasonable offence”. He argued that this would still “hamstring broadcasters” and wants no reference at all to “offence” in the Broadcasting Act. anything which may reasonably be regarded as causing harm, or as being likely to promote, or incite to, crime or as tending to undermine the authority of the State, is not broadcast by the broadcaster. Donnelly argues that his suggestion “removes just two words from the Broadcasting Act” and would “immediately fix one of the biggest flaws in the legislation”. Taoiseach Enda Kenny said that the Government was not opposing the bill’s entrance to the house and would be looked at by Minister Rabbitte. Email “'Anti-Pantigate' bill tabled in the Dáil to stop "the litigious and thin-skinned"”. Feedback on “'Anti-Pantigate' bill tabled in the Dáil to stop "the litigious and thin-skinned"”.